Posted on November 9, 2018 by Betsy Jacoby-Greenleaf. Thankfully live chat has come a long way from the cheesy and irrelevant responses when live chat first came on the scene. Instead of adding to the frustration, it now serves as a gateway to creating satisfied customers. According to a report from Zendesk, a whopping 92% of customers get more gratification from using live chat than they get from any other option. It’s not surprising that live chat has surpassed its negative reputation to become a very valuable tool for both consumers and business owners. 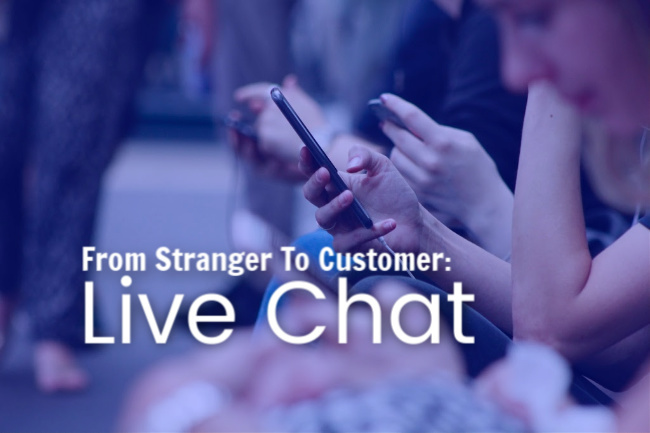 In the conclusion of our three-part series, From Stranger to Customer, we will explore the benefits of adding live chat to your website to increase conversions and create happy customers. Trust is the most important element in any relationship, and gaining consumer (attendee) trust should be your key objective. Without trust, there is no relationship. Period. First impressions are crucial and visitors should always leave your event website with a positive first impression. The live chat feature shows that you are upfront about answering any questions they might have. Transparency goes a long way in establishing trust in a relationship. Trust is built when an attendee knows that you are working hard to resolve any issues they might be experiencing. Live chat also demonstrates that you care about their concerns and are available 24/7 to help them find answers. When a visitor uses live chat it often indicates that they are about to make a decision but need more information in order to completely convert. Having someone who is ready and willing to answer questions can help alleviate any hesitation the consumer might have about purchasing. FAQ sections can’t answer every specific question that comes up and rather than having a potential attendee leave unsatisfied, their question can be answered. Your chances of making leads decrease the longer consumers have to wait for a response. People simply do not have the patience to wait twenty minutes for an answer. Contacting leads in a timely manner equals more sales and there is simply no way around that. There is nothing stopping someone from going back to their Google search and clicking on the next result which makes expediency really important. What do we tend to do with information that isn’t applicable to our situation? We discard it because it’s irrelevant and useless to us, right? You don’t have to worry about that with live chat anymore. The responses now provide links containing relevant articles and information that won’t just go in one ear and out the other. That information helps influence a buyer’s decision in a big way. It shows that you are cognizant of their needs and are working to satisfy them. There are many choices out there for live chat platforms and costs are low or free, depending on the options you choose. It provides a good value for show managers since the increased customer confidence and leads more than make up for the little time and money it takes to implement it. You won’t have to interrupt your time to answer as many phone calls or respond to emails which reduces your costs in the long run. We live in an age of instant gratification and when it comes to event customer service, a delayed response can mean a loss in ticket sales. Live chat is an effective way to show your attendees that you care and that your attentiveness doesn’t end there. They can be confident that you are dedicated to their experience, even after they have purchased a ticket. It’s usually the little things, like attentiveness and personalization, that make big things happen; those small gestures are what turns a stranger into a customer.